After Solar Panels,Solar Inverters are the second most crucial component of the overall solar system accounting for around 10% of the overall costs.Solar inverters connect the solar panels to the grid converting the DC to AC which is used by the grid.Note for off grid solar installations,solar inverters are required as most electrical devices need AC for their operation.There are both grid tied and non grid tied inverters available on the market.Solar inverters have become highly sophisticated with features like optimization and monitoring etc.The efficiency of solar inverters are a major factor in their purchase as well as the quality and reliability.Inverters comes in various sizes and can be as large as 1 MW for utility applications.Note unlike solar panels,solar inverter manufactures are much bigger in size with SMA Solar having a 40% global marketshare. Solar Inverters can make a huge difference in the amount of electricity generated by solar panels over the lifetime of the solar array.You should be careful of any lesser known inverter brand they are offered as part of a home solar power system before installing them. While some of these inverters may have certification this does not mean they can perform as well as the good brands.Skimping of a few dollars here and there may make you penny wise and pound foolish. Stand-alone Solar Inverters – They are used in systems without a connection to the power grid.Inverter draws Energy from Solar Energy. Many stand-alone inverters have attached batteries.These are mainly used in off grid application and in residential/commercial applications where there is no net metering available. Grid Tied Solar Inverters – Many solar inverters are designed to be connected to a utility grid, and will not operate when they do not detect the presence of the grid. 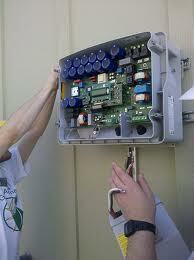 They contain special circuitry to precisely match the voltage and frequency of the grid. Grid-tie inverters are designed to shut down automatically upon loss of utility supply, for safety reasons. They do not provide backup power during utility outages.These are higher priced than standalone and require special laws to be used.They are always used in solar power plants connected to the grid. SMA Solar – The Big Daddy of the Solar Inverter Market with a 40% Marketshare of the Global Market,this Germany company has become the most valued solar company in Germany beating out the old stalwarts like Q-Cells and Solarworld. SMA Solar sells all ranges of solar inverters in various sizes which are suitable for every size and segment.SMA Solar sells for a premium as compared to the lesser known brands but its long history of quality and reliability make it the hottest selling solar inverter. Xantrex/Schneider Electric – This European Electrical Equipment Giant got into the solar inverter market by buying up Canadian Producer Xantrex.Like SMA Solar Schneider is known for its premium high quality products. Power One – The US power management company has shown the fastest growth in 2010 and has increased its marketshare to around 13% to become the No.2 global player.Power-One is mainly concentrated in Europe and is now expanding to Asia and its home market of USA.PowerOne 2kW, 3.6kW. 4.2kW, 5kW and 6kW inverters are all AS4777 and Clean Energy Council approved.Power One has very good quality and sells cheaper the European manufacturers of solar inverters.Power One meets the trade-off in quality and price and IMHO the best solar inverter. Excelsior – This is a local Australian Brand of Solar Inverters.The company sells lower priced products and has been in the business for around 20 years.The comapny sells most of its Solar Inverter after sourcing it from SMA Solar .The price range is $1800 for a 1 kw inverter to $5000 for a 5 kw inverter. RefuSol – This is also a German manufacturer of solar inverter and is sold by distributors in Australia like the other solar inverters. Selectronic – Another local Australian manufacturer of power inverters in Australia since 1983. It sells in the range of 0.1-13 kw . factories throughout China which has been growing rapidly in recent year.The company’s main selling point is its price which is cheaper than the European solar inverters.However you don’t get the efficiency of the premium models with Kinglong.The company sells solar inverters in the price range of $500 for a 1.5 kw inverter to $1500 for a 5 kw inverter under the brand of SunTeams. Sharp – Sharp is not known for manufacture or sale of solar inverters.It however sells a very small range of solar inverters mostly to boost its solar panel business in Australia.It sells a JH1600 E 1.6 kw solar inverter. Solar Inverters sell for a wide range of prices depending on the quality,brand and features.In general European solar inverters from SMA,Xantrex sell for a higher price than that from Chinese makers.The Chinese solar inverters are the cheapest as you can buy a 5 kw solar inverter for $1500 compared to $5000 for a premium solar inverter from SMA.Power One falls in the middle and it gives better quality and reliability compared to the Chinese and sells at a lower price as well. Read more about solar microinverters and differences with solar inverters .These solar microinverters are becoming the rage in USA.